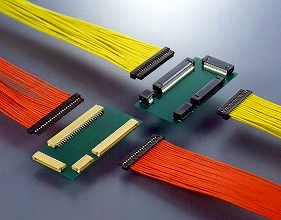 FI Series | Japan Aviation Electronics Industry, Ltd.
1.25 mm pitch, Board-to-Cable connector for internal connection of small devices. 1row type suitable for thin devices, 2rows type for high density packaging. Box type receptacle with wall on four sides, Crimp type plug easy to terminate. 1.25mm pitch, Board-to-cable connector for internal connection of small devices. Receptacle with hold-down for preventing float up when soldering, and offering additional retention on board. Crimp type cable plug for discrete wire. Key for preventing erroneous mating. Receptacles can be supplied in embossed tape allowing automatic mounting.